As winter drags on here in Wisconsin, ones thoughts lead to travel. Most people choose to go somewhere warm, like Florida or Mexico. We chose to visit my cousins in Denver. I never saw my cousin Eric growing up as his parents divorced when I was very young and he lived with his mom. We have had a great time reconnecting and Eric and Jennifer joined us on my Regal Tour of London last August. We could not wait to spend time with them again! Our flight from Milwaukee to Denver went smoothly and we were greeted upon arrival by Eric and Jennifer to whisk us off to explore the Denver area for a long weekend. We first stopped for lunch at Biker Jim's Gourmet Dogs in downtown Denver. It was a great introduction to Denver and German Veal Sausage and house baked beans really hit the spot! it was a fun place to try something new! After lunch, we set off on a tour of downtown Denver including the Colorado State House, a typically grand building with a gleaming gold dome! We then set off for the Red Rocks Amphitheater south of Denver. Red Rocks is a special place for Eric and Jennifer to see concerts and they were very excited to introduce us to it. is a beautiful place where the rocks formed a natural amphitheater that has been used for nearly 100 years. The moment was made more special as it started snowing and made a great scene with the white snowflakes against the red rocks! We really want to come back in warmer weather to attend a concert here sometime. 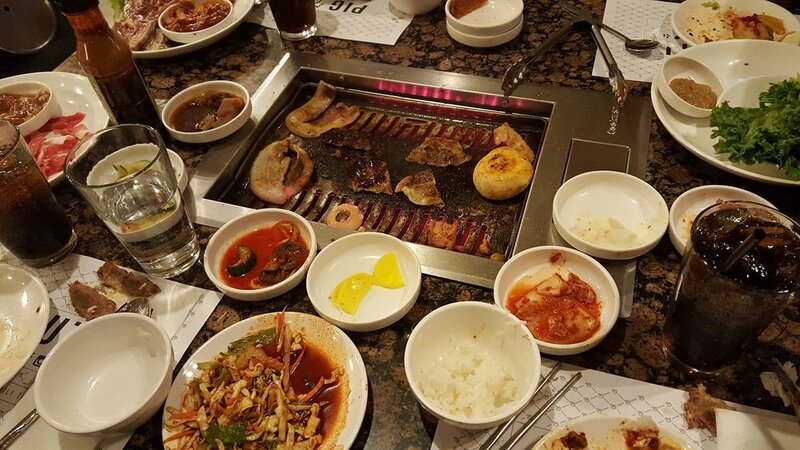 As the snow started falling, it came on fast and soon were in bumper to bumper traffic and it took us several hours to make it to our first new dinning experience : Dae Gee for Korean Barbecue. We were inspired by the Olympics and I saw this place on Diners Drive Ins and Dives! It was good fun as you are seated at a table with a grill in the middle. They bring you out several meats to grill and an assortment of sides to enjoy there were various salads and varieties of kimchi.....it was all delicious! We finally got settled at the house thanks to the amazing driving skills of Jennifer! We slept well and woke up the next day to have breakfast at a great place called Snooze, crowded even on a Friday morning! We then set out for Colorado Springs to tour the Olympic Training Center and visit the US Figure Skating Museum and Hall of Fame! The Olympic Training Center was an impressive place, very high tech! They have everything you need for mind and body to succeed in Olympic sports. Our athletes are very fortunate to have this support based on donations! We took a terrific tour to see several of the facilities! It was a great way to celebrate our athletes in PyeongChang! The Home of US Figure Skating and the World Figure Skating Museum and Hall of Fame was also a fun stop. The museum is packed with figure skating memorabilia from a history of skating blades to uniforms, costumes, memorabilia, medals and trophies! A great place for those who are fans of figure skating! After our full day in Colorado Springs, we went out for margaritas and enchiladas at La Delicious Mexican Restaurant. Saturday arrived cold and windy. We went to have breakfast at a Waffle House(one of our favorites when travelling) and journeyed up into the very windy and cold(20 degree) Estes Park . Riding up to the mountains was beautiful and we arrived in Estes Park at the Historic Stanley Hotel(inspiration for The Shining)! The porch would be more welcoming on a warmer day, but the lobby was inviting with lots of wood, a grand staircase and a fire in the fireplace. We walked around and opted not to take a tour, but enjoyed our short visit non the less. We walked downtown Estes Park enjoying the galleries and shops and we saw many, as we needed a refuge from the strong, cold winds. We ate that night at an Italian restaurant called Papa Franks, it was delicious with home made pasta and sauce, Yummy! Sunday proved to be much warmer (40's) and less wind! We had tasty breakfast burritos made by Jen and we then set out for Boulder. We found Boulder to be a great college town! The 9th Street Mall reminded us of nearby State Street in Madison. There were wonderful galleries and shops to visit. We did our part to support the local artist community and were worried we would need another suitcase! (We didn't) We tried to eat at the Dushanbe/Boulder Tea House, but the wait was extremely long and we just gave up and went and had cheesecake at the Cheesecake Factory! I think cheesecake is the answer to most questions, haha! We even found the house used in the TV show Mork and Mindy from the 70's. Good fun!! We shopped some more and then headed back to the house to watch the Olympic Closing Ceremonies. It is always sad to see an Olympics end but I look forward to going to Tokyo 2020! We ordered in pizza and just enjoyed our last night with the cousins. My cousin Eric dropped us at the Denver airport on Monday morning and our return was uneventful. 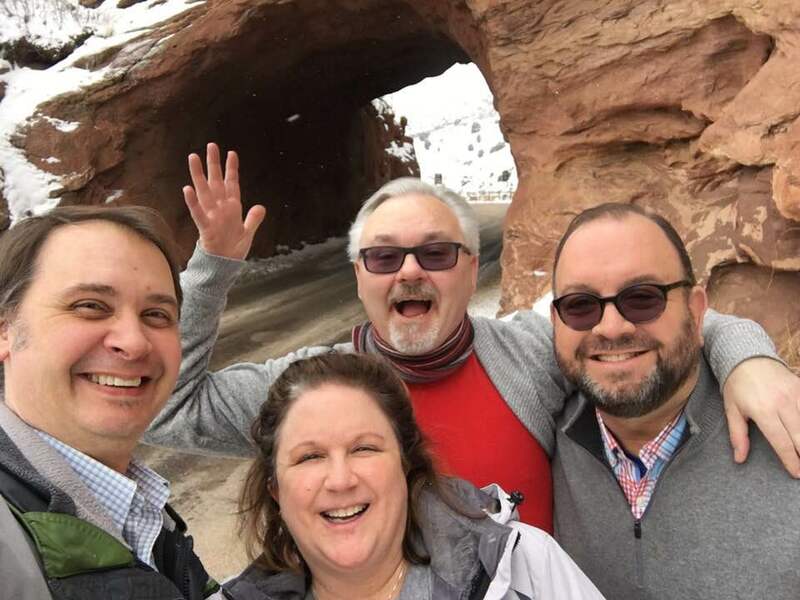 It was a fabulous weekend with good people, great sites and good food......what more could you want from a weekend in Denver! The Mork and Mindy House! NaNuNaNu! The cousins gone wild! Eric, Jen, Dan and Roaming Rich!